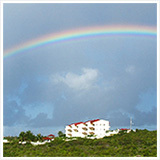 One of the great differences between living in Anguilla and vacationing in Anguilla, isn't just the long-lasting sunshine, heat or beaches. It's all of the new experiences you're exposed to... All of the special things you do that you wouldn't necessarily uncover on holiday. There's just too much to do, too much to see, too much to taste. 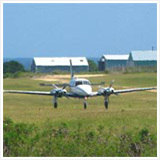 It can't all be packed into a ten-day trip (that includes flying days!). 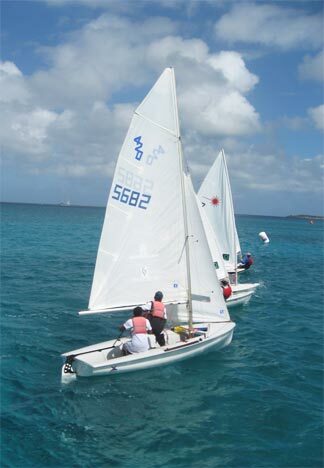 The Anguilla Youth Sailing Club is a part of the Anguilla Sailing Association. 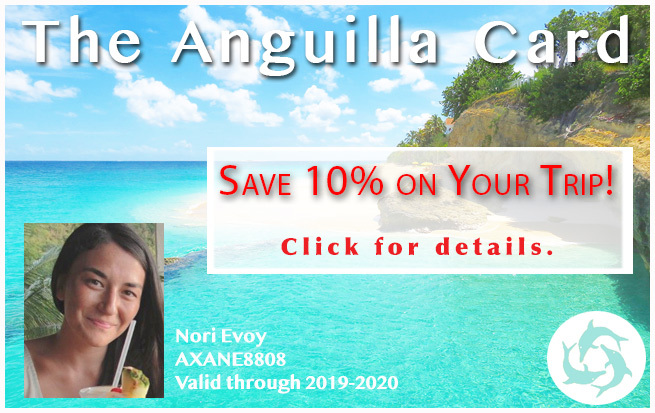 Their main goal is to raise funds to support their sailing school for both local kids and kids just visiting Anguilla (the school also gives adult lessons). 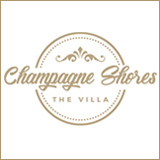 Located on Sandy Ground, many kids congregate here even when they aren't taking sailing lessons! It may be a school, but it's also a fun spot for kids to spend a lazy afternoon of leisurely sailing, fishing and swimming, doing odd jobs for the sailing school, or even giving sailing lessons. The sailing school has a warm community feel that Yuki and I took to immediately! Yuki started sailing months before I did... Never having sailed a day in her life, she enrolled in the beginner sailing group class, starting on an Optimist boat ("Optis"). I took a couple of lessons before dropping out, nearly in tears. The instructors are with you every step of the way, but it's still tough! Maybe I'm just a baby though... Yuki has persevered through it all, along with her classmates who are between 9 and 11 years old. He! He! The beginners tend to sail around Sandy Ground's quiet, calm harbor, Road Bay. That's perfect for Yuki, due to her severe fear of dark, deep water. It's when she's offered the opportunity to leave the harbor, to go beyond the clear, turquoise sea that she panics! 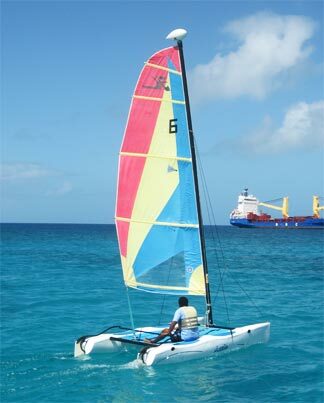 "Hobie Cats", the boat in the photo to the left, are my favorite! They are so exciting... traveling faster than the other sail boats, just skimming the surface of the waves. 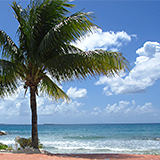 I have been taking private lessons from a sweet, Anguillian named "Rumple". He doesn't normally give sailing lessons on his own, but I trust him. He may only be 14 years old but he's an expert sailor. He just feels the wind, boat and water. Yuki and I sail regularly, but we also volunteer-teach! Not advanced sailing of course... We volunteer for the sailing school's "Starfish Class". The Starfish Class is for young kids, ages 4-7. 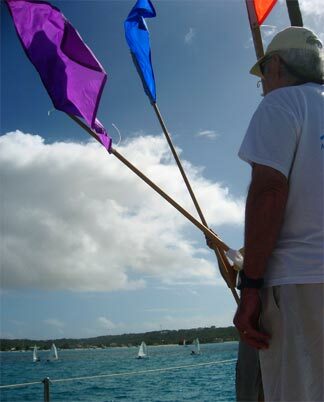 We teach them the "pre-beginner" basics of sailing, fishing, and other marine sports and life. 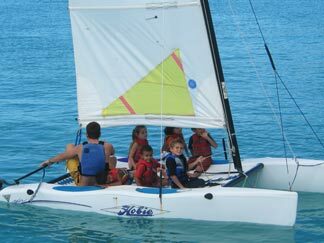 Our friend Sam used to teach the class... That's him on the right taking the kids for a ride around Sandy Ground harbor on the Hobie Cat! Yuki and I have a blast teaching the Starfish Class. They are so adventurous! I wasn't sailing around the sea and jumping off piers when I was 5 years old. 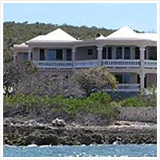 There are a few children who are regulars, living on Anguilla, but many just join the class for a couple of weeks, while they're here. The beauty of it is how all of these kids, from all over the world, get along so well. 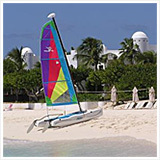 The Anguilla Youth Sailing Club brings out the four year olds, the ten year olds, the fifteen year olds, the twenty year olds and of course all of the parents! 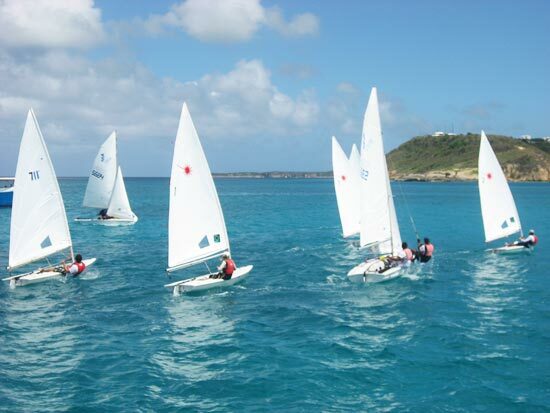 The school hosts a sailing regatta each year, bringing together the whole sailing club community! All of the Moms come out to help organize prizes, sell t-shirts, provide lunch, and make sure everyone is well-fed, thirst-free and having a fun time! All of the Dads come out to monitor and keep track of the races. This year the ones in the regatta either raced Optimists, 420s, Hobies, or Lasers. Those who weren't part of the race either soaked up the sun on the beach, or went out with the Dads to watch the races. Yuki and I did the latter. 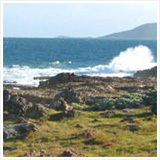 The race took place around Sandy Ground harbor. We were taken to a beautiful, 50' sailing yacht, docked in the bay, owned by a lively, friendly British man, Nigel! Here, we were assigned various tasks... signaling the start of the race, spotting the winners, timing the winners, and recording all of the information. That's our friend Noah in the picture above. 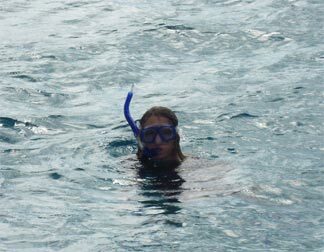 He and I started off just jumping from the yacht, swimming, and somehow spearfishing was added into the picture. I couldn't deny the opportunity of seeing a 4' barracuda! 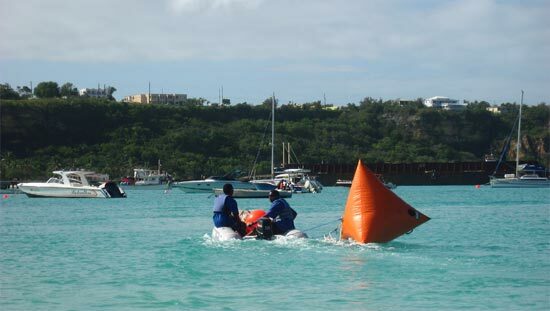 Sailors from both St. Maarten and Anguilla came out for the event. 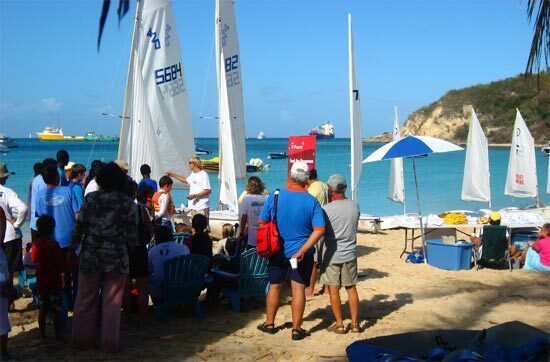 One St. Maarten sailor blew Anguilla out of the water in the Optimist league. He finished every race minutes ahead of those trailing behind, with a fierce look of determination! 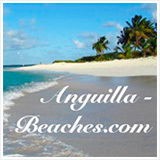 Anguilla won most of the trophies! Rumple (my sailing teacher) sails just about any boat very well, but none as well as the 420. That's him and Kenny on the left in the 420. Starting at 9:30 and only ending around 3:30, with a short lunch break in between. 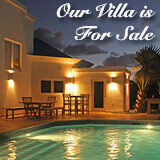 No doubt about it, the Anguilla Sailing Association is a great organization. Yuki is down there at least two or three times a week. We both spend every Saturday volunteering, sailing and enjoying the funny, friendly atmosphere. If you would like to sign up for lessons, or sign your children up for lessons, don't hesitate to come by the sailing school. Many people just drop in and sign up on the spot! 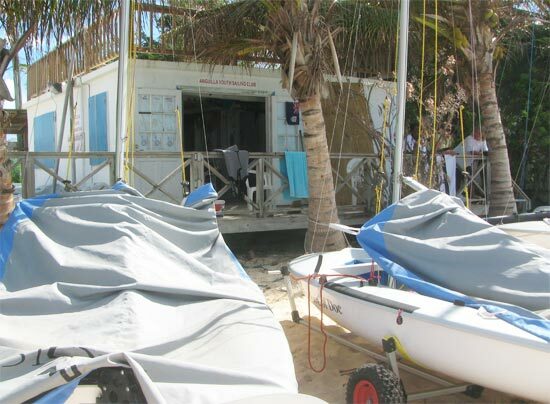 The sailing school is located on Sandy Ground beach, right across the street from the Pumphouse. 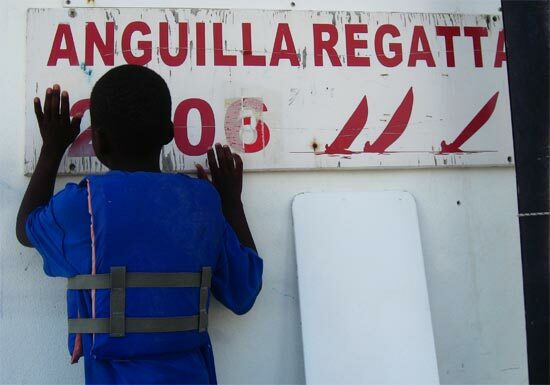 The Anguilla Sailing Association is always open to donations. 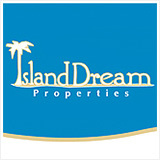 They are a non-profit organization, acquiring all of their materials (boats and boat equipment) through donations.